According to the GOV, " HS2 reveals design vision for new stations in Birmingham and Solihull. HS2 will release images for 2 of its brand new stations, marking a significant milestone for the programme, cementing the project’s commitment to the Midlands and emphasising the region’s place at the heart of Britain’s new high speed network." But of course pictures have been sneaking off for back-street assignations with dodgy reporters, and have been appearing in sort-of public (i.e. mostly paywalled). However, Construction Enquirer has several to look at. For reference, Grimshaw were lead on the Birmingham Corzon Street design, and Arup for the Solihull Interchange. My reaction is that they are inevitably big, but grandiose rather than grand, but then that is traditional for railway stations. My only SLIGHT reservations regarding such large and innovative structures are can they be delivered on time and on budget, and will the structures be RELIABLY safe and weathertight, even in extreme weather. Hopefully no glass panels that are liable to fall, as at Waterloo international, nor any inflatable roof sections in which birds can peck holes. I am in favour of innovative and impressive stations and other public buildings, providing that "innovative" is not code for "hugely delayed, over budget, and bits drop off in high winds"
HS2 could be dramatically scaled back amid public opposition to the scheme, the Transport Secretary has admitted. Chris Grayling said that the second phase of the line, which would connect Birmingham to Leeds, was "not in the bag". His comments, to rail industry figures, represent a major departure from the Government’s previous insistence that construction of the scheme would proceed as planned despite mounting questions about its costs and value for money. While the main demand for new capacity is met by the first HS2 phase, there is absolutely no point whatsoever in building it to high speed European gauge if it doesn't go any further. Expensive, heavy, non tilting classic compatible trains that would be slower than Pendolinos north of Birmingham would not be justified for only 100 miles of new HSR. It would be a staggering waste of money to go ahead with phase 1 as currently planned if there is doubt over phase 2, and I'm a supporter in principle. The whole thing is a colossal waste of money and should be scrapped without further ado. The money could be far better spent elsewhere. The Telegraph were being a touch disingenuous - Grayling wasn't advocating HS2 be scaled back, just urging the rail industry to continue making the case and not become complacent about the second stage being a 'done deal'. "According to the Sunday Telegraph, Mr Grayling was quoted as telling a rail conference in London that HS2’s second phase was “not in the bag” and could be scaled back. HS2 dismissed the claims as “nonsense”, while the Department for Transport said in a statement that the claims were “completely and utterly untrue”. CN understands that Mr Grayling was referring to the “parliamentary process” of approving HS2’s separate phases when making his comments. The DfT said: “The Sunday Telegraph story is absolute nonsense – it takes statements out of context that were made at an event several weeks ago not attended by the newspaper. I'm glad that has all been sorted out, then. I feel confident once again. HS2: a magic money tree? Unthinking populism has led some to put forward scrapping HS2 as a solution to worrying projections of economic losses from Brexit. ‘Here’s £50bn we could save and spend instead on (say) the NHS’. But scrapping HS2 does not create a magic money tree. Rather, it would be an act of extreme short-termism, signalling no belief in the future of the UK. For a start, aborting the capital spend on HS2 means losing the stream of economic benefits it generates at roundly the rate of £2 benefit of every £1 outlay. More reliable, quicker rail journeys, more capacity for commuters, fewer lorries on our motorways; fewer people travelling by car and air – so fewer accidents, and less carbon; a huge stimulus for businesses to locate in Birmingham, Manchester, Liverpool, Preston, Crewe, Leeds, Sheffield, York, Darlington and elsewhere; a chance to re-structure services across the existing rail network – benefits that translate into higher productivity and a more balanced economy worth £100bn+ would all be foregone. The belief that scrapping HS2 would provide the state with a magic money tree overlooks the fact that HS2 can and surely will be used to return a huge cash pay-out directly back to Treasury. 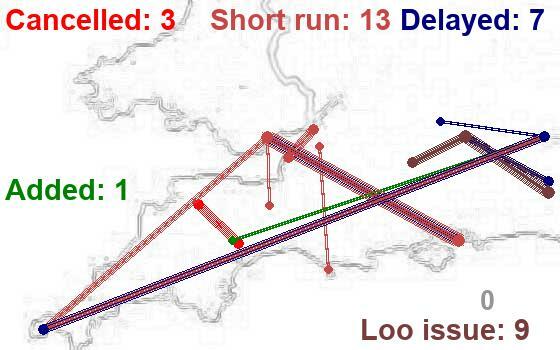 Just look at the experience with HS1 (the channel tunnel rail link, as was). Just two years after its completion, it was sold on a long-term concession to a major pension fund. At a stroke, HM Treasury recouped around 40% of the line’s capital cost. The pension fund is happy: it has a secure and reliable income stream from track charges levied on Eurostar and other users of the country’s only high-speed line to date, on which demand for train paths growing steadily, year-by-year. So much so, that it recently changed hands at a premium. And it doesn’t stop there. The concession is time limited, so 30 years on, it can be sold again, no doubt for a much higher amount. Now compare HS2 with HS1. Rather than 2-3 international trains/hour and a handful of commuter trains for Kent (with half of the line’s capacity yet to be taken up), HS2 will start with 11-12 intercity trains each hour. The income prospect is much higher than with HS1, even on a per mile of route basis (the first phase of HS2 is twice the length of HS1). If a similar or equivalent approach is taken, much more than 40% of the Treasury’s cash outlay on HS2 could be returned by this route alone – and again, just a few years after its opening. True, Government hasn’t said it will do this with HS2. It might favour another way of recouping its capital outlays on HS2. It might use the proceeds from HS2’s first phase to fund the second. It knows these options are bumper bonus opportunities for Treasury ten years hence. Even this is only part of the fiscal bonanza. The economic stimulus from HS2 will have a whole range of tax implications. Higher productivity means more profit and so more tax, expanding employment, higher pay levels and so more tax income. Greater investment by the private sector to capitalise on the gains HS2 offers – and note, the development boom around Birmingham’s Curzon Street station has already started – is likewise a source of extra tax revenue. So yes, in a sense, HS2 will be a magic money tree once it is built. But scrapping HS2 would mean huge cash returns to Treasury as soon as the line opens will be lost. Glad someone else here has grasped that macroeconomics is different. For what, though? Most of the article is paywalled, but John Armitt is talking about 'additional upgrades'; do these have additional benefits? I am not against Hs2 because of cost, route or BREXIT. I am against HS2 because I don't believe that the UK's size and population distribution lend itself to high speed rail. Major cities are to close and its is inconceivable to run long routes without stopping at Birmingham, Manchester|Leeds. The consequence of this is why should we spend £50-100BN to save a few minutes of individual journeys. As a country we need better rail links, faster services, more rail resilience.